I’d like to thank California Walnuts for sponsoring this post! I’ve loved walnuts my whole life, but just recently began to experiment with this tasty ingredient in my recipes. 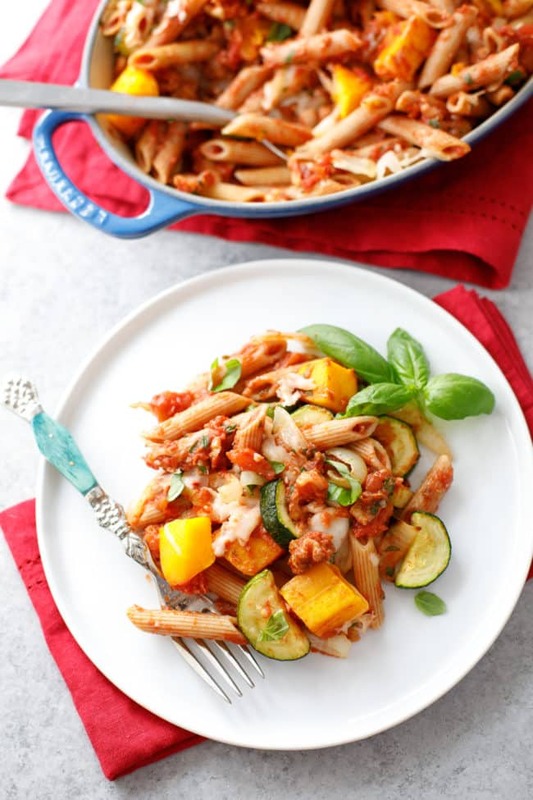 One of my favorite walnut-inspired meals is this comforting and nourishing veggie baked penne with walnut sauce. The flavor here is incredible, and I love that this dish is packed with so many heart-healthy* ingredients! *Supportive but not conclusive research shows that eating 1.5 ounces of walnuts per day, as part of a low saturated fat and low cholesterol diet and not resulting in increased caloric intake, may reduce the risk of coronary heart disease. (FDA) One ounce of walnuts provides 18g of total fat, 2.5g of monounsaturated fat, 13g of polyunsaturated fat including 2.5g of alpha-linolenic acid – the plant based omega-3. Did you know that more than 99% of the walnuts in the U.S. are grown in the fertile soils of California’s Central Valley? I think that’s really quite remarkable, and it gave me a whole new perspective on my favorite nut. I’ve really been shifting my thinking about walnuts a bit over the past few years. While I used to view walnuts simply as a snack or a way to add some crunch to my salad, I now truly appreciate how versatile and delicious they can be in my everyday cooking. Plus, California walnuts have SO many health benefits. Namely, walnuts are a healthy source of fat, and they are rich in omega-3 essential fatty acids. 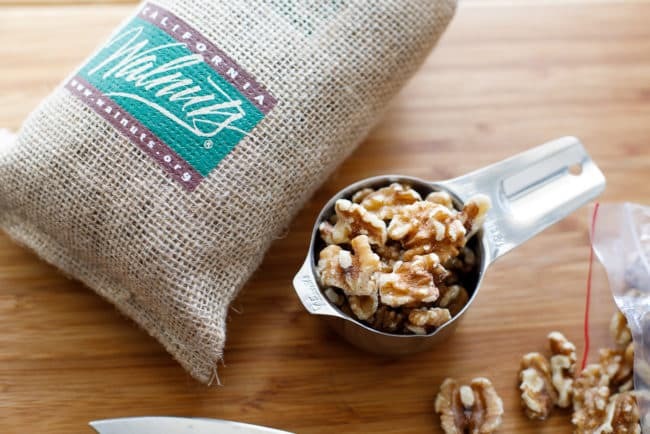 In other words, California walnuts are wonderfully healthy for your whole family—including your kiddos! 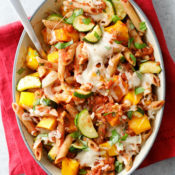 I was inspired to create this veggie baked penne with walnut sauce while trying to utilize some of the fall vegetables that I had on hand. 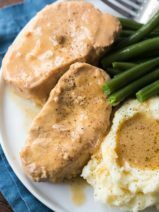 I love creating simple and wholesome meals for my family, and this one has quickly become a favorite, thanks to my easy walnut sauce that really stands out as the star of the dish. I’ve found that when using walnuts in sauces, my favorite method is to first toast the walnuts for about 8-10 minutes in the oven at 350°. You’ll know they are perfect when they become aromatic and lightly crisp. I then stir the toasted walnuts and fresh basil into my sauce to finish it. 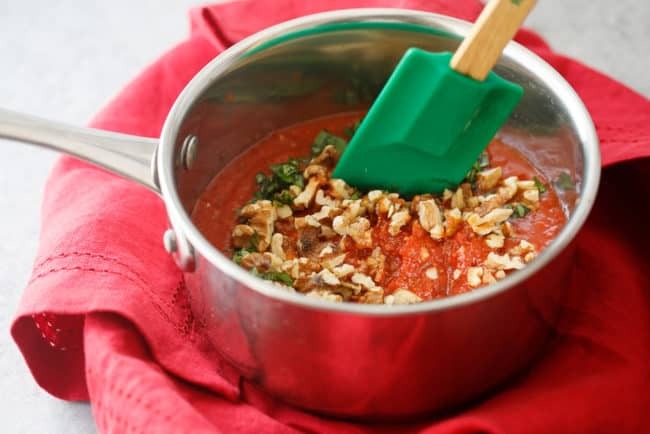 The toasted walnuts add an incredible flavor and texture to the sauce! My easy walnut sauce would also work well on spaghetti, or any pasta dish. My scrumptious walnut sauce pairs deliciously with the pasta and roasted vegetables. 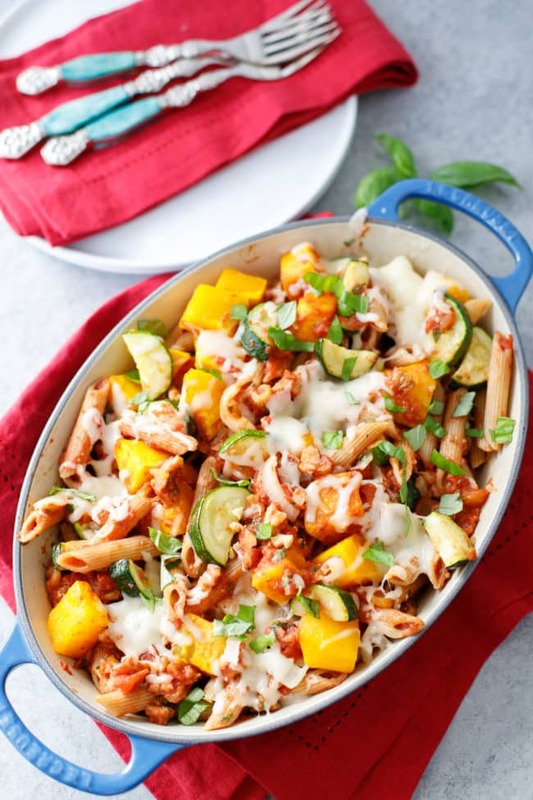 We love the combination of butternut squash, zucchini and onion, but you can easily swap these out for any vegetables you have on hand. I hope you’ll follow my lead and begin to experiment with tasty and nutritious California walnuts in your kitchen. If you have any walnut-inspired recipes, I’d love to hear about them in the comment section below! You can learn more about California walnuts and find more recipes on their website. You can also follow them on Twitter, Facebook and Instagram for tips, ideas and dinner ideas. 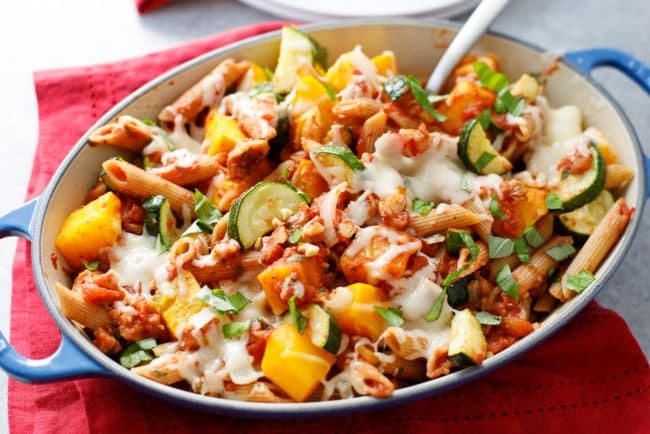 This easy casserole is nutritious and delicious! Preheat oven to 350° F. Coat vegetables with one teaspoon olive oil and spread evenly on baking sheet. 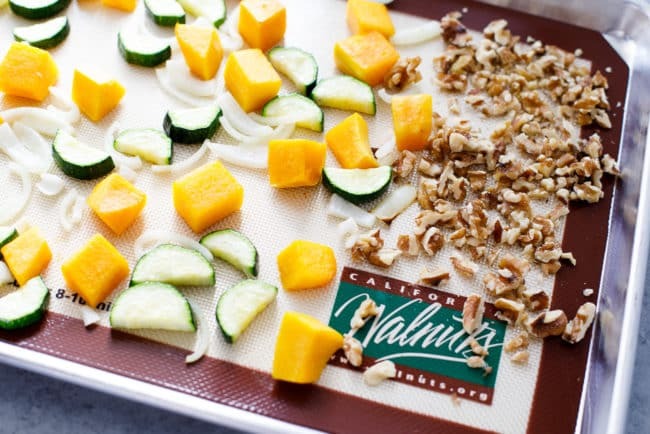 Bake for 25 minutes, then add the walnuts to one end and bake an additional 8-10 minutes. 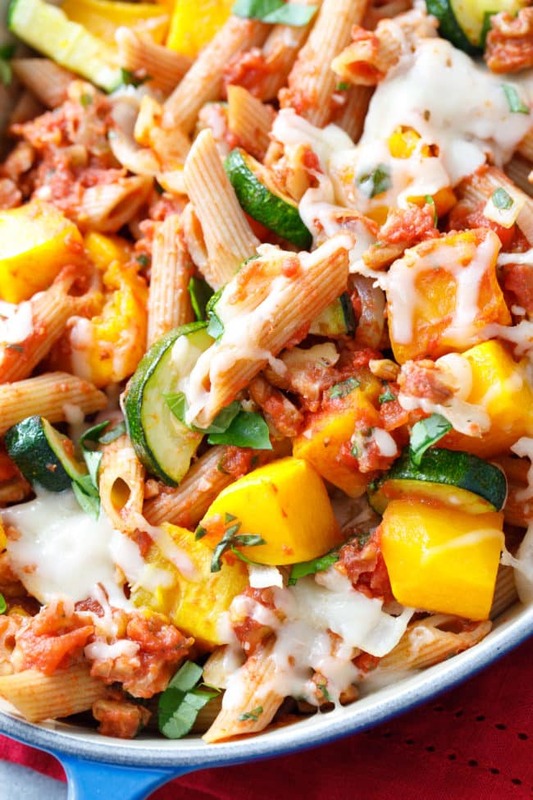 Cook the whole wheat pasta; set aside. In a medium saucepan, add one teaspoon olive oil and the garlic; sauté 1-2 minutes. Add crushed tomatoes and oregano; simmer for 10 minutes. Remove from heat; fold in the walnuts, then fold in the pasta and vegetables. 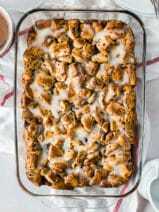 Spread evenly into a 1 ½ quart baking dish. Sprinkle with cheese and bake 5 minutes, or until cheese is melted. The Vegi Penne Pasta Casserole was good. However, I just printed out the recipe and did not look at the pictures until now. So the written recipe instructions did not say to put the walnuts into the pasta sauce on the stove. Nor did the written instructions indicate how or when to add the basil. So I just stirred in the walnuts into the casserole prior to adding the cheese. I’ll be doing it correctly next time! I believe the written instructions should address all the ingredients. Just a thought. We Vegi Penne Pasta Casserole was good. However, I just printed out the recipe and did not look at the pictures until now. So the written recipe instructions did not say to put the walnuts into the pasta sauce on the stove. Nor did the written instructions indicate how or when to add the basil. So I just stirred in the walnuts into the casserole prior to adding the cheese. I’ll be doing it correctly next time! I believe the written instructions should address all the ingredients. Just a thought. Yum, this sounds amazing! Ive been obsessed with walnuts lately! 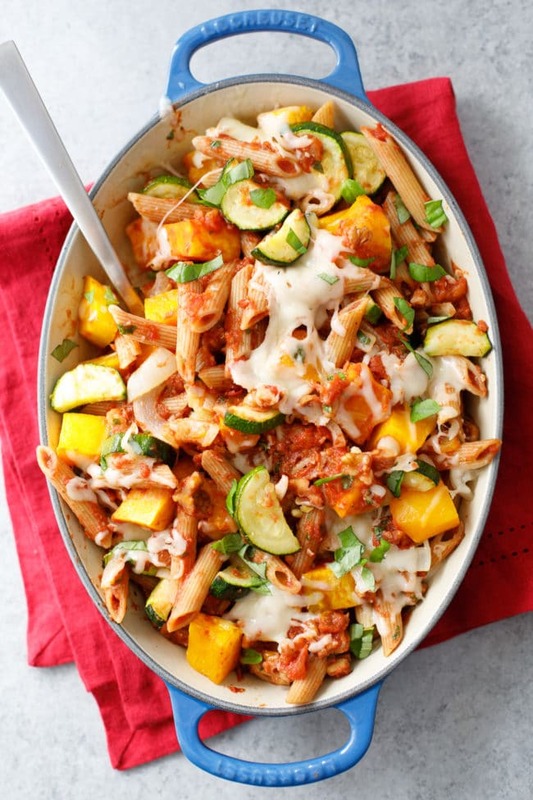 I don’t think I’ve ever used walnuts in a savory recipe before but this Veggie Penne does look really amazing! I’m a longtime vegetarian, and this recipe looks SO good! 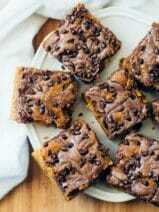 I’d love to try making it soon! I love walnuts! 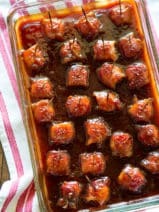 This looks like a delicious and flavorful recipe! I’d love to try and make it soon!